NAMM 2017 was something of a eurorack renaissance, featuring way too many amazing modules to include in one comprehensive list. Instead, I’ve built a list of the manufacturers and modules that stood out in my mind because they cater to areas of eurorack that have either been totally neglected or offer an interesting update to an old bag of tricks. If the creativity in the eurorack scene at NAMM this year is any indication, it’s going to be a great year for synth heads. The Tapographic Delay features a FSR (Force Sensing Resistor) tap pad, which are velocity sensitive pads that allow for precise pressure sensing rather than merely reacting to the surface of the user’s skin. When the FSR pad is tapped, the velocity echoes and will have an effect on whatever parameter of the module it is assigned to. For example, velocity can affect the amplitude, the loudness, LPF, and BPF. These configurations can then either be sequenced via external clock, and/or saved and stored as presets. The Stereo Triggered Sampler features two audio channels that each feature pitch and sample-select controls. The unit allows for 10 samples per bank with an unlimited number of banks. Each channel is able to be configured to loop by holding down the “play” button, and all parameters are CV’able. The unit also features a stereo recording channel that can record samples into any of the banks. The VCNO is a compact noise source that packs a lot of functionality. It can be used more traditionally as a hi-hat or manipulated to create abstract timbres. It features a CV pitch in, clock input, and several different outputs that emphasize its crunchy, noisy character, as well as random trigger and gate outputs. Continuing in the tradition of other Mutant modules like the BD9, Mutant Hi-hats, and Mutant Snare, the Mutant Rimshot seems pretty straightforward at first – a drum module based on the 909 circuit. But after some careful play, it quickly becomes apparent how gloriously warped things can become. The unit features a resonance, modulation decay, clav mode, HP filter, and overdrive sections that enable the construction of sounds that are nothing like a traditional rimshot. The module at the forefront of the Industrial Music Electronics display for 2017 (and the one I found to be at the top of their list across the board), is certainly a beast deserving of its title. Argos Bleak is a quad Master VCO controller, specifically designed to integrate oscillators from several different manufacturers. 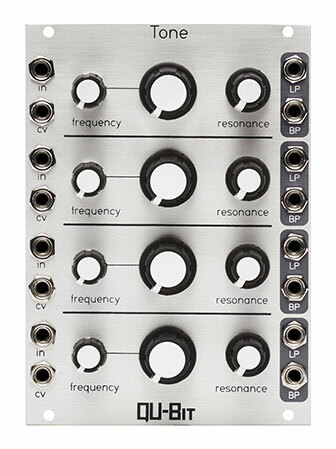 The module features two inputs capable of accepting DC signals that are then routed to the unit’s four outputs, each of which features a 32-preset quantizer (that can be stepped through as a chord sequence), a slew limiter on each channel that can be routed either before or after the quantizer, and a tactile interface that afford users realtime control over semitone and octave offset. The Bionic Lester is a 2-pole, dual multimode filter with a switched capacitor design, bi-polar mixers for each output, and a master mixer section that enables a parallel mix of both inputs and can be patched in series. At its core, the unit is an analog filter with discrete time capabilities, capable of aliasing. But unlike its predecessor, the MK2 has an anti-alias setting. The unit features three outputs: lowpass, bandpass, and variable – which is capable of changing from notch, to allpass, to highpass – and three modes that alter the input distortion. Contempt is a stereo analog compressor gate. Or, as Scott himself put it, a “dynamics manager.” The circuit is essentially a VCA with digital control. The unit features a digital sidechain that can be blended via CV and a compressor and gate section – each with three different modes that affect the gain and time: green (inspired by FMR RNC unit), orange (inspired by the SSL E Series channel compressor), and red (extreme mode). Plonk is a collaboration between Intellijel and Applied Acoustic Systems. The module is a physical modeling percussion synthesizer with an engine similar to AAC’s physical modeling plug-ins, Chromaphone and Tassman. The module consists of two 24 bit/44.1 kHz voices and features an exciter section comprised of a mallet model and noise source (complete with filter and envelopes). The exciter is routed to a resonator that models a variety of physical sources including plates, strings, marimbas, and drumheads. Most of the parameters are voltage controllable, opening up a plethora of possibilities for experimentation. For example, via CV, users can store and recall the resonator’s parameters and select/recall/sequence the 128-storable presets, all in a compact 12hp! The Tetrapad is an intuitive performance controller capable of several different modes of operation, including virtual sliders, XY controller, and CV generator / quantizer that enables users to quickly select and recall chord sequences. Two units can be chained together for a total of eight channels with future expansion modules planned that will open up additional functions and allow for more pads to be daisy chained together. Just like its name portends, the quad VCA features four VCA’s, each with continuously-variable response curves, 6dB boost switch, and LED indicators for positive and negative CV. The VCAs are normalled together, meaning that they can be controlled by a single CV source, but can be removed from the chain by turning off the attenuator. The module’s outputs allow for a summed mix or individual channels to be patched out, making it an efficient mixer. Shifty is a multi-functional module that is capable of acting like a sequential switch, sample and hold, and analog shift register. 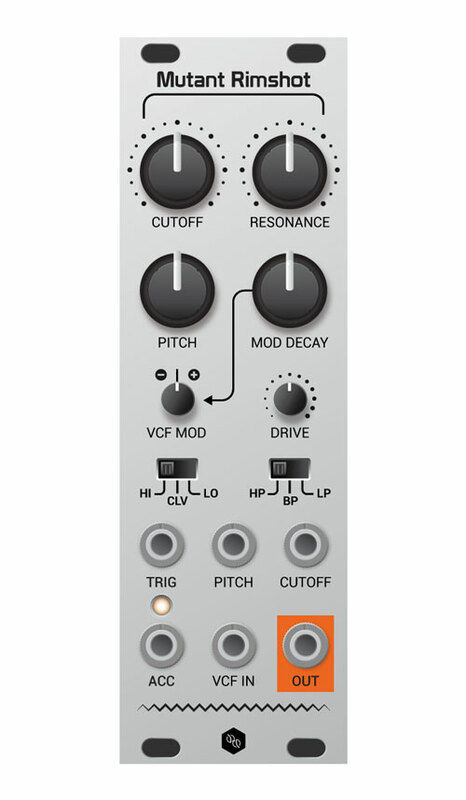 The module allows users to patch a monophonic sequence and have each step trigger a different voice. 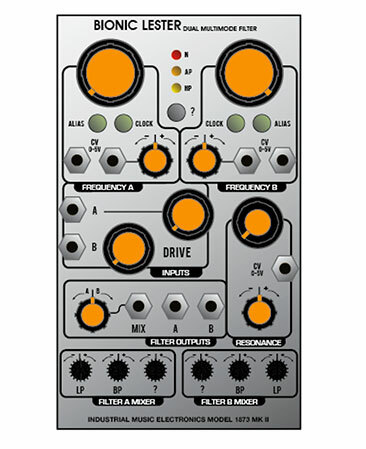 Until now, achieving this in eurorack would require several different modules. But Shifty makes this both easy and intuitive with a module that contains several different modes, such as a shift register mode, scatter mode, and ping pong mode, making it a welcome addition to any system. 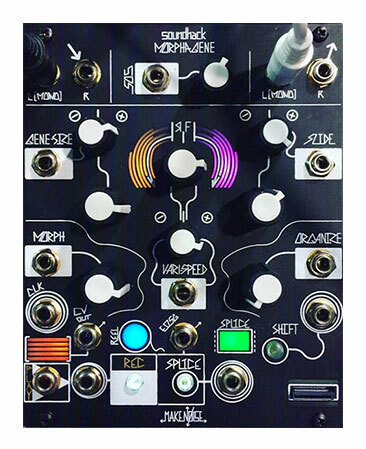 Intellijel has redesigned their famous Springray from scratch. Where the old model was a voltage-driven tank, the new version is current-driven and includes a parametric EQ and vectoral circuit. In cut mode, the unit is capable of eliciting an almost phaser-style response, which sounds incredible. This and the Plonk make quite the exciting combo. 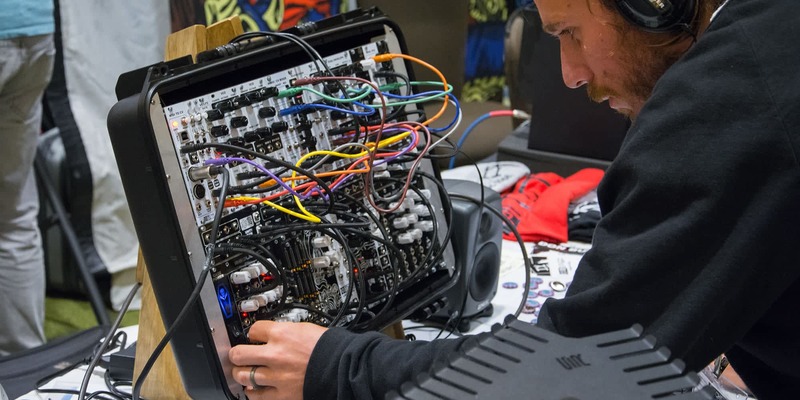 Reverb sent a small crew to get the scoop on the fifth annual Knobcon, a gathering featuring some of the biggest synthesizer enthusiasts and manufacturers. 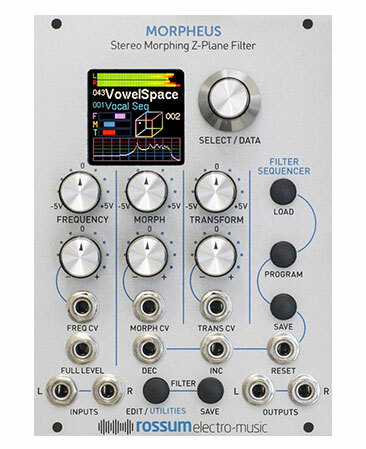 Coded by Soundhack, the Morphagene enables users to load sounds via SD card and “shift” through splices, either by pressing a button or sending a gate to the allotted input. The unit allows users to smoothly change the speed, direction, and size of the sample. Did I mention it sounds really smooth? All parameters are voltage-controllable, and the module features an envelope follower that makes it possible to patch the module back into itself or to send the signal elsewhere in your patch. Also worth noting are the sleek black faceplates for Make Noise’s System Cartesian. The LXD and Telharmonic have never looked better! As its name suggests, the Cursus Iteritas oscillator is a relative of the Loquelic Iteritas. The module features three modes – each with a slightly different character – that govern the output composition, bandpass controls (center, width, tilt, structure), a razor-sharp wavefolder, and an edge control that adds wicked harmonics. This was my personal favorite of the new batch. Think of this one as the Loquelic Iteritas re-imagined as a percussion module. 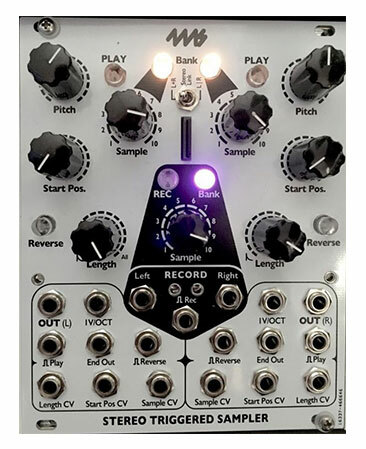 It features the same core synthesis as the Loquelic Iteritas but includes a built-in envelope (itself switchable between three stages) that is able to be routed to every parameter of the module. The effect is a very raspy, aggressive sound that should make fans of the Loquelic Iteritas and Bassimilus Iteritas very happy. Furthermore, unlike the Loquelic Iteritas, every switch on the module is CV’able. The Horologic Solem is an extremely playable master clock in a compact 4hp that boasts a 4-step clock divider, continuous tempo control, and various switchable modes – all of which make it both versatile and tactile in terms of playability. But what really inspired me about this module is the way the components have been yoked down to the essentials: a single knob and a few switches. The unit is also features an expander that offers additional fixed clock divider outputs. 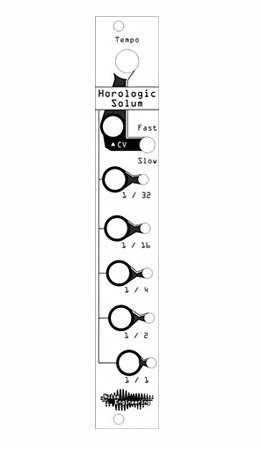 The Mimetic Sequent is a CV recorder and randomizer inspired by Music Thing Modular’s Turning Machine, but in a much more manageable 6hp. The module is switchable between three patterns, and each pattern can be quickly copied to the other two channels with variations you can produce simply by turning the master knob. The variations and randomizations are very musical and able to be saved to flash memory and recalled after the unit is powered off. Sequent is expandable by Mimetic Multum, which offers 4 channels of CV and gate expansion in 4hp. The Variatic Sequent is a small, playable gate sequencer. The module allows users to quickly and effortlessly program a sequence and features an expander that allows for CV control over every knob and provides separate outs for each gate. Finally, an efficient tuning solution in eurorack. Tune your oscillators in seconds while sacrificing only 4hp. The module enables users to patch and tune up to three oscillators, select them with a switch and tune them with the master knob. I was particularly impressed that I had not seen something like this on the market already – this is a welcome utility for any setup. Tone is a quad VC analog filter with a 24dB slope. True to its name, the module is all about fat, warm tones. The module can self-oscillate when its resonance is cranked, and its CV inputs are calibrated at 1V/Oct, enabling the unit to track across 4 octaves with CV patched. The Contour is a quad envelope generator. Each channel features an attenuverter, attack and decay controls, CV inputs, cycle/loop functionality, a range of 5ms to 20 minutes, and a switch that gives users the ability to select either linear or exponential envelopes. Qu-bit quickly pointed out that one really special feature of this module is its chaining ability. At the press of a button, one of the other three channels can be linked to the selected channel. Once this is done, every time the selected channel completes its cycle it triggers the associated channel. Channels can be interlinked like this in order to produce more complex functions simply by triggering a the initial channel. Chance is a random voltage generator featuring four CV outputs and a blend output in 14hp. The outputs consist of clock out, analog white noise, digital noise, gate bursts, and musical randomized gates. The blend control allows for effortless morphing between each voltage type, while the freeze button forces every output to hold its present value. The original incarnation of Dave Rossum’s E-mu Morpheus synthesizer was ultimately stunted by processor limitations that rendered it incapable of morphing in more than one dimension. Today, this is not a problem. The Morpheus module unleashes the full potential of the 14-pole Z-plane filter by offering simultaneous CV control over its complex filters and filter configurations, allowing users to select from over 190 filter configurations then morph between the eight filter types. The module features the ability to save and recall custom filter configurations, a sequencer that allows users to step through filter configurations in sync with an external clock, and a brilliant OLED display that depicts the morph position on a digital cube.